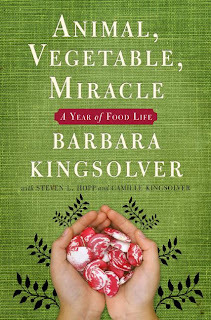 Barbara Kingsolver has been tackling gritty subjects in her novels for years, yet it was her first non-fiction effort Animal Vegetable Miracle that really impacted me, inspiring me to change the way I consume resources. In it, Barbara documents the year she and her family spent deliberately eating food produced in their local area. Much of it they produced themselves, the rest they sourced from their local farmers' market, neighbours or other organically and ethically run farms within a 100 mile radius. Barbara's husband, Steven, and 19-year-old daughter, Camille, co-write the book with her. Steven digs into various aspects of food-production science and industry, while Camille gives her thoughts on their local-food project, along with nutritional information, meal plans and recipes. Animal Vegetable Miracle is pure pleasure to read, full of humourous anecdotes and interesting facts. I've read it cover to cover three times - it's become a sort of annual tradition of mine, inspiring me to use well what I've been given. "Americans put almost as much fossil fuel into our refrigerators as our cars. We’re consuming about 400 gallons of oil a year per citizen – about 17% of our nation’s energy use – for agriculture, a close second to our vehicular use. Tractors, combines, harvesters, irrigation, sprayers, tillers, balers, and other equipment all use petroleum. Even bigger gas guzzlers on the farm are not the machines, but so-called inputs. Synthetic fertilizers, pesticides and herbicides use oil and natural gas as their starting materials, and in their manufacturing. More than a quarter of all farming energy goes into synthetic fertilizers. "But getting the crop from seed to harvest takes only one fifth of the total oil used for our food. The lion’s share is consumed during the trip from the farm to your plate. Each food item in a typical U.S. meal has traveled an average of 1500 miles. In addition to direct transport, other fuel-thirsty steps include processing (drying, milling, cutting, sorting, baking), packaging, warehousing and refrigeration. Energy calories consumed by production, packaging and shipping far outweigh the energy calories we receive from the food. "A quick way to improve food-related fuel economy would be to buy a quart of motor oil and drink it. More palatable options are available. If every U.S. citizen ate just one meal a week (any meal) composed of locally and organically raised meats and produce, we would reduce our country’s oil consumption by over 1.1 million barrels of oil every week. That’s not gallons, but barrels. Small changes in buying habits can make big differences. Becoming a less energy-dependent nation may just need to start with a good breakfast." Before reading Animal Vegetable Miracle, I hadn't realised what a massive impact our 'I want it now, so I'll have it now' culture was having on this planet, especially when it comes to food. I've grown up in an era where it's common practice to eat tomatoes in winter, despite them being a summer fruit, and before reading this book I'd never thought about the resources it takes for people to be able to do this. Animal Vegetable Miracle is optimistic in its outlook; We have the power to change the way we use and consume resources, and even small changes have a big impact. Like, apart from growing my own fruit and veges at home, one change I've made since reading Animal Vegetable Miracle is when buying produce from the supermarket, I first check to see that it's been grown in New Zealand (where I live). Fortunately, supermarkets are getting on board with this, and labeling the country of origin more often than not now. This book has also encouraged me in my organic gardening endeavours. Particulary the chapter where the Kingsolvers visit Amish friends and witness the sizable difference between corn fields that have always been grown organically, and those that have only been treated organically for the past ten years. The forever-organic corn towers above the rest, even after ten years of the same treatment, giving visual testament to the long-term, negative impact that pesticides and synthetic fertilisers have on the earth. Then God blessed them and said, "Be fruitful and multiply. Fill the earth and govern it. Reign over the fish in the sea, the birds in the sky, and all the animals that scurry along the ground." You can see photos of the Kingsolvers' homegrown efforts on their personal Animal Vegetable Miracle website. However, it really just gives a slice of the story; I would recommend you read the book to get the full picture. I couldn't get to this book before it was due back. I'll have to request it again. Thanks for sharing the rec! You're welcome. It's such an encouraging book - everyone I know who's read it has gone on to give it to other people because it's that good.